So happy to celebrate our second baby Boy. This time I select the Jungle Tropical theme, to remember our islands we did everything in green, white and gold. I was so excited to celebrate this baby shower, that I did all the centers of tables by my self...ajajaj! An only one month of Mateo arriving our lives, we celebrate the baby shower, I was lucky to found this lovely place that in my opinion was just perfect, I really love the colonial feeling of this place and for our luck with the colors that I select for the Baby Shower. So happy to celebrate our second baby Boy. This time I select the Jungle Tropical theme, to remenber our islands we did everything in green, white and gold. Muy feliz de celebrar la llegada de nuestro segundo bebé varon. Esta vez seleccioné el tema de Jungle Tropical, para recordar nuestras islas, hicimos todo en verde, blanco y dorado. Estaba tan emocionada de celebrar esta fiesta de bienvenida al bebé, que hice todos los centros de mesa por mi misma ... ¡ajajaj! A solo mes de la llegada de Mateo nuestras vidas, celebramos el baby shower, tuve la suerte de encontrar este encantador lugar que en mi opinión era simplemente perfecto, realmente amo el sentimiento colonial de este lugar y nuestra suerte con los colores que seleccionar para Baby Shower. I was crazy about a Donuts bar, and here is the table! A super green bar with fruits and many bakery, for all the tastes! I bought all the plastic safari animals and painted with gold paint in a spray! Just in love with the cake thanks to Guadarrama Family and that perfect circle sign by Thepolymathmom! So happy with my hobby and son Diego, matching with white shirt and green pants! Feeling like a princess with this fabulous dress by Adrianna Papell! Here all our friends and family praying for our new baby Boy Mateo! 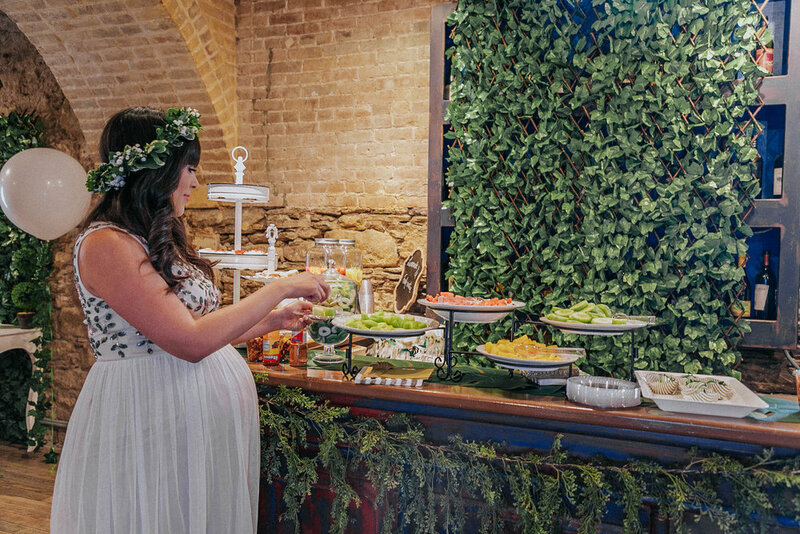 Special thanks to El Pasillo de San Agustin for this fabulous place, so magical and perfect for Mateo's Baby Shower.